The 2018 Norco Storm is designed with the recreational rider in mind. The Storm is a hardtail mountain bike and is the perfect ride for exploring new trails with family and friends. Take a spin on one and feel the difference: reliable braking, smooth, crisp shifting, and responsive handling – all in a lightweight design that will help you get the most from your ride, every time. Frame Storm 6061 Alloy XC Frame, Rock Shox XC30 TK 100mm Fork, WTB SX19 27.5″ DW Rims, WTB Beeline 27.5″ x 2.25 Tires, Rear Shimano Acera SLM3000R 9spd Shifter, Shimano Alivio Shadow 9spd Rear Derailleur, Shimano Acera CS-HG2009 11/36 9spd Cassette, Feimin Alloy Pedals, KMC Z99 9spd Chain, Tektro HD-M285 Hydraulic 160mm Brakes Front and Rear. Bafang 750watt BBS02 mid drive with digital colour controller, 5 levels of assist (programmable up to 9) Fully programmable motor controller. 52volt 13.5 Amp hour Panasonic Li-ion Shark Battery. Upgraded Mosfet Controller. The 2018 Norco Fat Bike Is truly designed to go anywhere in any season. Featuring a redesigned frame for 2018, the Norco Bigfoot provides outstanding flotation through snow and sand alike for winter expeditions and epic beach rides. 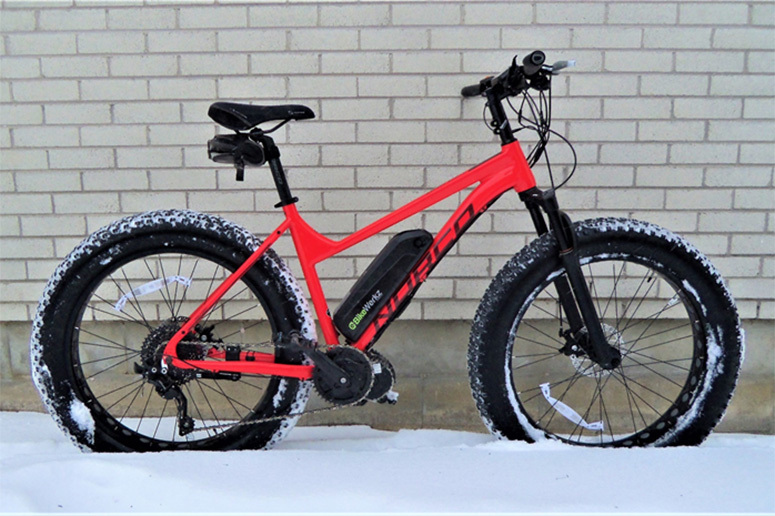 With a new, lighter aluminum frame and clearance for up to 5” tires, the Bigfoot is an efficient and maneuverable bike for all-season cyclists looking for year-round fat bike adventure. 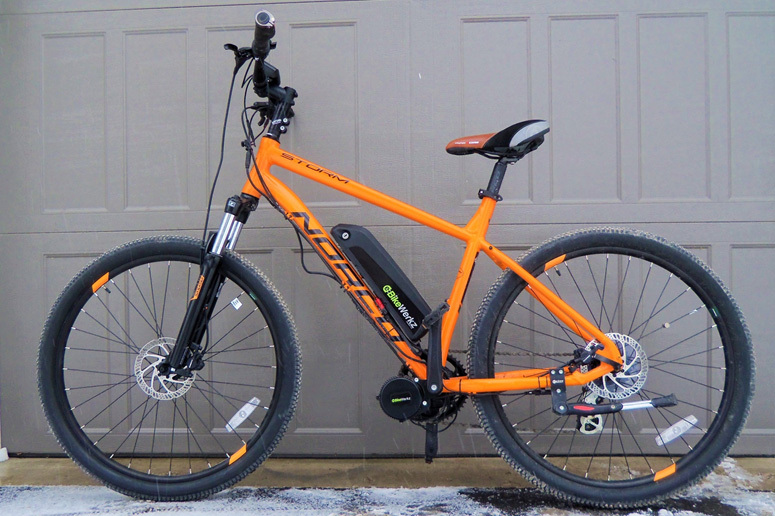 Exploring a snow-covered trail in the dead of winter or cruising the beach under the heat of the summer sun, this bike is for all-season cyclists. Norco 6061 X6 Alloy Bigfoot Fat Frame, Lunacycle fully adjustable Front fork with lock out, Alloy SW 80mm 26″ Fat Rim, CY H-5176 26″ x 4.9″ Fat Tire, Shimano Deore SL-M6000 10spd, Norco XC Saddle, Tektro MD-280 160mm Mech Disc brakes. Bafang 1000w BBSH2 mid drive motor with digital colour controller. 5 levels of assist (programmable up to 9) Fully programmable motor controller. 52v 13.5amp hour Panasonic Li-ion Shark Battery. Upgraded Mosfet controller. This bike will go anywhere!